I'm very proud to announce that with Narayana 5.0.0.M3 we are now JTA 1.2 compliant! What's more, with the release of JCA 1.7 in WildFly 8.0.0.Beta1 (WFLY-510), the new application server features are now available. I'd like to say a big "thank you" to the community members who provided feedback during the design and implementation of this specification. Like most of our larger features, this was discussed over at the Narayana developer forums, giving the community the opportunity to shape the development of these features. 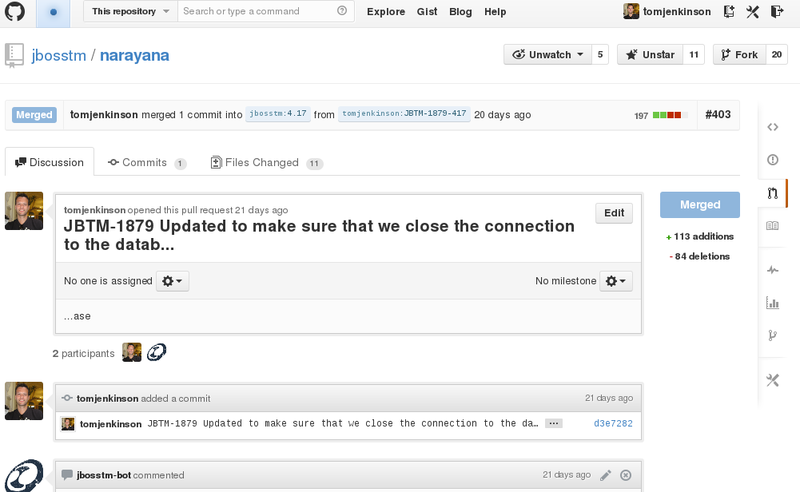 So what's new in JTA 1.2? @Transactional. This is the headline feature and brings the ability to place transaction annotations on any CDI managed bean. Prior to this feature, you had to make your class an EJB in order to use transactional annotations. @TransactionScoped. This feature allows you to associate CDI beans with the scope of a transaction. The third change clarifies when the container should call 'delistResource' on the transactional resource. This is a minor change and is of less interest to an application developer, so I'm not going to discuss it further here. The remainder of this post will tell you what you need to know about these new features and provide some examples, showing how they can be used. This new annotation provides an alternative to javax.ejb.TransactionAttribute that can be placed on CDI managed bean classes and its methods. Prior to this feature, many developers were using EJBs just so that they could use declarative transactions. Now you can make an architectural decision of wether EJB or CDI is the right approach for your application, knowing that you will be able to use declarative transactions with either approach. The remainder of this section will show an example using @Transactional and highlight the differences between @Transactional and the EJB @TransactionAttribute. The "@Transactional(Transactional.TxType.MANDATORY)" annotation on the class states that, by default, all methods must be invoked within the scope of a JTA transaction. This can be overridden on a per-method basis. The 'doSomethingWithoutATransaction' method overrides the 'MANDATORY' type with "NEVER". Therefore, this method will fail if it is invoked in the scope of a JTA transaction. Specifying what Exceptions should cause the transaction to rollback is specified differently with @Transactional. With EJB's @TransactionalAttribute, the developer had to declare on the actual Exception class whether an exception of that type, thrown from a method annotated with @TransactionalAttribute, should cause the active transaction to be marked for 'rollback only'. The problem with this approach was that it could not (easily) be applied to third-party exception implementations and it also applied for all usages of that exception. @Transactional fixes these issues by allowing the developer to specify on a per-method basis, which Exception types (and sub-classes of) should cause a rollback. This is done through the 'rollbackOn' and 'dontRollbackOn' attributes. By default, RuntimeException and its subclasses will cause a rollback. Another difference to watch out for is the default behaviour when no transaction annotation is provided. With an EJB, the default value of TransactionalAttribute is TRANSACTION_REQUIRED. This means that a new JTA transaction is begun (when calling the method) if one doesn't already exist. This works for EJB as the developer has already opted-in through the use of an EJB annotation (@Stateless, @Statefull, etc). With CDI, a managed bean can have no annotations, thus it is difficult to differentiate between it and a regular POJO. Therefore, the default value for @Transactional is TxType.SUPPORTED. This means that the method will run within a transaction if one exists; otherwise it will run without one. This is essentially how transactions are handled with java POJOs. With @TransactionScoped brings an additional CDI context to accompany @SessionScoped, @RequestScoped and @ApplicationScoped. Annotating a bean with @SessionScoped ensures that the same instance of the bean is made available for all usages of it within the scope of a http session. This allows the developer to easily share state between multiple requests within a session, whilst also isolating it from other requests in a different session. @TransactionScoped allows data to be shared between all usages of the bean within a particular transaction, whilst isolating the instance from other accesses of the bean within a different transaction. The TransactionScoped bean instance's lifecycle matches that of the transaction. MyCDITransactionScopeBean represents the data to be associated with the active transaction. It is simple POJO annotated with @TransactionScoped and also marked as Serializable. MyCDITransactionScopeBean can then be injected into other classes that need to use it. Go and give it a try! Just download the latest version of WildFly and start deploying code. We don't yet have any quickstarts for these features, but our Arquillian tests provide a complete example of how to use the functionality. If you are interested in getting involved in the open source community we would love to hear from you! We are always looking for new contributors to help out with the broad selection of enhancements and features we are looking to add to our project. The best approach to take is to have a look at our Jira instance and see if there are any items on there that you would like to see added to the project. 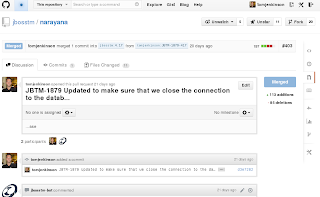 Our Jira instance is located over at: https://issues.jboss.org/browse/JBTM where we have all of the dev tasks waiting; from development to build management, and from documentation to JDF style quickstart writing. 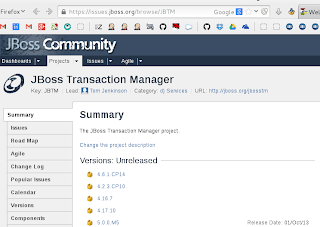 Once you have developed your contribution, first make sure you have signed the JBoss Contributor License Agreement over here: https://cla.jboss.org/, then raise a Pull Request on our of our repos. Where reasonable, each Jira issue is tackled in a single commit - time to squash! After you raise a pull request on one of the Narayana repos, one of our team of highly skilled "buildbots" will take a look over it and run our comprehensive test suite against it. The buildbot will keep your pull request up to date with comments as it works its way through the various phases of test and hopefully at the end will be able to indicate a complete build success! One of the devs will then be able to merge your update and your place in history as a contributor on the project is secured! Narayana 5.0.0.M4 and JBoss Transactions 4.17.9.Final released! Alongside the usual incremental fixes and enhancements, we are also happy to announce that the BlackTie project is now fully merged into the Narayana code base. This is the penultimate milestone release for Narayana 5. We are intending to release Beta1 in October and the .Final shortly afterwards.